They may be commonly found in caves but this is the first time I have seen them. I mistook them for chert nodules initially. Also, I am realizing that I am woefully ignorant when it comes to identifying bats. Can anyone point me to a good resource of info? GroundquestMSA wrote: Also, I am realizing that I am woefully ignorant when it comes to identifying bats. Can anyone point me to a good resource of info? The BCI Field Guide to Eastern Cave Bats is dirt-cheap, tiny, and printed on mud-proof paper, so you won't feel bad bringing it in cave to help you ID bats. Unfortunately, our cave bats are difficult to tell apart without experience seeing all of them to get an idea of their relative similarities and differences. - everything else is likely to be "Myotis species"... if they're clustered super-dense with pinkish noses, they may be Indiana Bats, less-dense (but still dense!) clusters or singles with pronounced lighter color bellies are likely to be Little Browns, tiny with a raccoon mask and all-by-his-self is probably a Small-Footed Myotis... but identifying Myotis species is difficult even with practice, and sometimes even with the bat in hand*. *Do not handle bats in the name of "citizen science", for your own safety, and for the bat's safety. 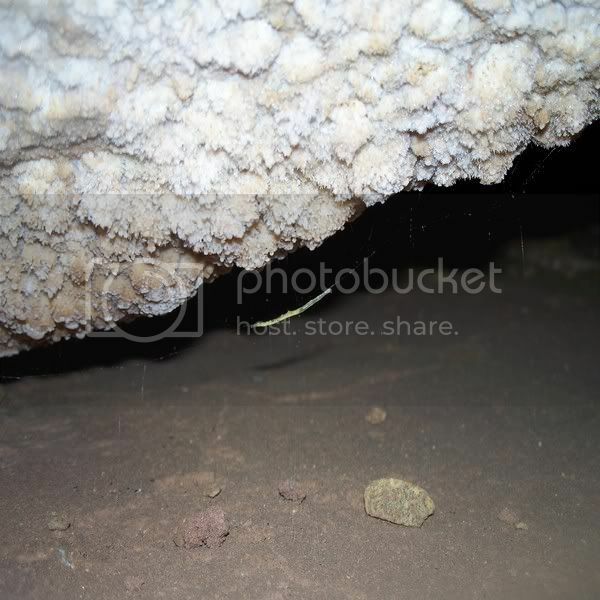 I need help identifying this worm I found while caving. I haven't seen anything like it in any caves in CO. I figure it may be a rare species. Unlike the cave silkworms that "fish" for prey by dangling their strings, this one was weaving a small silk web and just hanging out in the middle. Anyways, just interesting. Had me sitting there staring while the other 2 in my group went along with caving. I've seen very similar worms here in Ohio. These were a bit darker in color and their webs much smaller, but were otherwise identical. They were decided to be gnat larvae by the biologist I spoke to. I would say it is definately possible. Two other temperate moths (both in the genus Hypena) are also known to utilize caves occasionally. 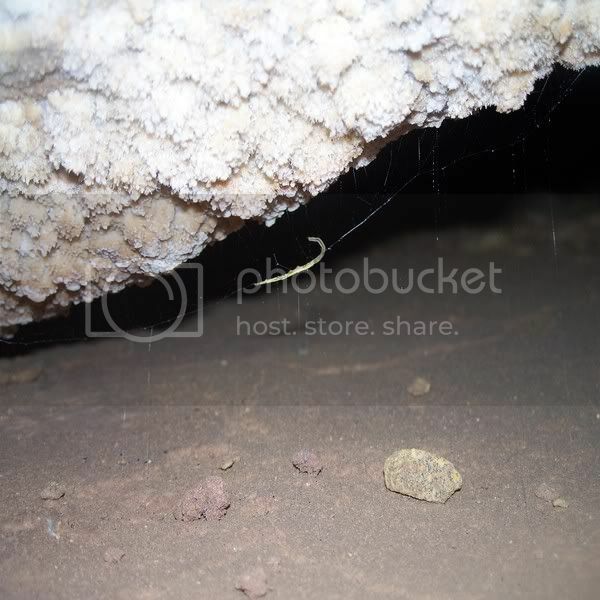 I have found discarded Hypena wings below orb weaver spider (Meta ovalis) webs in caves, so it isn't really that far of a stretch of the imagination to think that other predators would be eating moths in caves as well. As an example, what bat is this? I've not seen any positive id of local bats and I want to be sure before I publish a description. These are small, 2" to 3". GroundquestMSA wrote: As an example, what bat is this? I've not seen any positive id of local bats and I want to be sure before I publish a description. These are small, 2" to 3". Tri-Colored Bat (aka Eastern Pipistrelle), Perimyotis subflavus. There are several bat species who prey primarily on Lepidoptera (moths); the Tri-Colored bat does not.